Bac C (Maths-Physics) 1977 - Mention bien. DEUG A (SSM) Université Pierre & Marie Curie PARIS 6 (France) from 1978 to 1979. Oracle USA, Redwood Shores, CA, Consulting Member of Technical Staff at Oracle. 1PaaS-UI team, developing reusable visual components for all the Oracle's PaaS stack. Implementation of backend services as well, possibly hooked-uyp to the re-usable components above. Medallia, Palo Alto, CA, Senior Staff Member at Medallia. Ocean Admin Project, Report Builder, backend team. Designing, architecturing, and coding the REST services implementing the Admin features of Express' Report Builder. Swagger (with custom code generation), Java 8. BlueKai group (Oracle US), Consulting Member of Technical Staff. Brabus Project, managed by Syed Naqvi. Ingestion of data for analytic ad-hoc reports. Data are read from Kafka topics, processed by Spark jobs (written in Scala), and stored in HBase. HBase data are then queried upon user's request (ad-hoc queries), using Phoenix on top of HBase (SQL Layer). User Defined Functions (UDF) are used to access HyperLogLog (HLL) and K-Min Values (KMV) objects stored in the DB to compute the cardinalities requested by the user, using unions, intersections, symetric differences, minus, etc, on the various dimensions stored in the DB. User's requests are performed from REST services fired from a web UI. Oracle Corporation, Redwood Shores CA, Consulting Member of Technical Staff in the A-Team, managed by Mikael Ottosson. Cloud Applications Group, development organization managed by Ric Smith. Mobile Cloud Service (MCS) Project. Providing building blocks for the client-side implementation of the Oracle Applications Cloud. Specialized on SOA (Service Oriented Architecture), BPEL (Business Process Execution Language), ESB (Enterprise Service Bus), SCA (Service Component Architecture), and Rules Engines. Speaker at iDevelop 2005 & 2006, at Oracle Open World (2007 & after) in San Francisco. Numerous PoC (Proof of Concept) about SOA and related technologies, all over the world. Oracle Corporation, Redwood Shores CA, Senior Principal Product Manager JDeveloper, managed by Brian Fry. Specialized on the JDeveloper Extension SDK (the back bone of the IDE), Web Services, MVC Frameworks, Tuning, Monitoring and Auditing Tools, and the XML Features of the IDE. Speaker at iDevelop 2001 in Shanghai, São Paulo. Speaker at the Oracle Developers Days 2004 (Oklahoma City OK, Cincinnati OH, Toronto, Vancouver). BPEL, Web Services. Oracle Corporation, Redwood Shores CA, Senior Principal Consultant, Partner Technical Services, Internet Computing Group, managed by Larry Robinson, and Kevin de Smidt. Specialized on Java, CORBA, XML, JMS, Advanced Queuing and B2B techniques (SOAP, UDDI, WSDL). eBI (electronic Business Integration), OIS (Oracle Integration Server), OMB (Oracle Message Broker). Oracle 8i, 9i, JServer, JDeveloper, XDK, etc. OTN Contribution with Robert Dell'Immagine. Conception and realisation of the Java RoadMap web site. Workshops and Seminars in Redwood Shores CA, Belmont Shores CA, Bellevue WA, Seattle WA, Little Rock AR, Austin TX, Washington VA, Dallas TX, Denver CO, Los Angeles CA, Orange County CA, Chicago IL, Ann Arbor MI, Portland OR, Pittsburgh PA, Santa Clara CA, San Francisco CA, Altlanta GA, Bethesda MD, Sophia Antipolis (France), Orlando FL, Irving TX, etc. Collaboration with SUN for the Sun Tech Days (Stockholm, Amsterdam, Prague, Singapore, Tokyo, Washington DC, Paris). XML and Web Services papers and keynotes during the event. Speaker at the Colorado Software Summit 2000, in Keystone, CO.
Leader on the PAX project, business integration and synchronization (Java, XML, JMS, Advanced Queuing), later made SOAP compliant. Oracle France, Principal Consultant Partner Services Southern Europe, managed by Francis Collignon, part of DMS EMEA (Europe, Middle East and Africa), managed by Olivier Cabot. Member of the NCACOE (NCA Center of Excellence) managed by Todd Untrecht and Jay Peretz (Oracle Partner Program). Specialized on Designer 2000, NCA (Network Computing Architecture) and Internet Computing, Oracle Application Server and Cartridges development. Development at Redwood Shores, CA (Oracle Corp.) of demo cartridges for Oracle Web Application Server 3.0, in Rohit Kumar's team. Leader on PoST project. PoST in a Project and Skill Tracking System, implemented on the Web, and accessible for all DMS consultants in the world. It has been developed with the PL/SQL toolkit of the Oracle Web Application Server. Projet Internet Commerce Server : Integration of french partners in the project. Build a multi-tier Application with JDeveloper Suite (Oracle Application Server and JDeveloper). Oracle Consulting France. Unit QMO (Qualité, Méthodes, Outils). Monitoring, Workshops, assistance on projects, specialized on Designer 2000, focused on 100% generation techniques. Project Leader with SITINFO. Consulting as project leader for the "Laboratoires SERVIER" in Courbevoie (France), to develop the project BCVD (Base de Validation de Données Cliniques). This project is developed to allow biologists to validate clinical data, in order to commercialize new medicines and drugs. Clinical data are gathered in a product named ClinTrial, commercialized by BBN. 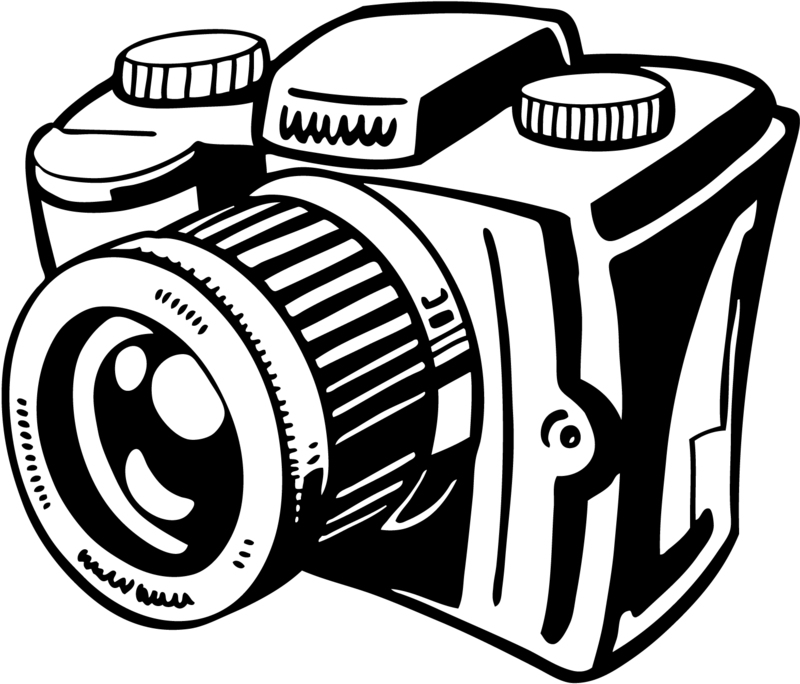 BCVD is developed with Oracle 7 and Forms 3.0. BCVD will be migrated in a client/server environment, with Forms 4.5. Consultant in the SIRE (Systèmes d'Information et Réseaux d'Entreprise) agency of CAP SESA TELECOM. SIRE Agency develops softwares, mainly written for France TELECOM. Project leader with ARES, since 1988. ARES is an ERP software editor, first european partner of Hewlett-Packard, and partner of Oracle. In charge of a new project, concerning an administration features of the ARCOLE suite, management software developed by ARES on Oracle. The role of this soft (ARCOLE ADMIN) is, on one hand, to federate all the administration functionalities of such a suite (users management, menus, users accesses, filters, etc.) and on the other, to manage all the batch features. This project was started with Oracle*CDE. This product has been designed since its analysis phase with the Oracle*Case Method. All the phases have been realized with Oracle*CASE 5.1, starting from entity-relationship diagrams and function hierarchy, including dataflows resolution, and filling all the matrixes. The Oracle DataBase is in version 7 and uses as much as possible its new functionalities (integrity constraints, triggers, stored procedures and functions, packages, management of alerts, signals, locks, provided by the V7's new packages). User interface is designed with Forms 4 for Windows 3.1. Batch programs are written in C, and call PL/SQL functions with the OCIs. Database design assumes the 5th normal form. - Development team includes three persons. - The database has 80 tables, the application 100 modules. - This soft has been presented at the Forum CDE organized by Oracle France on November 26, 1994, and in Oracle*EXPO 1994, and is released since October 1994. In charge of the evaluations of Forms 4 and Oracle*CASE 5.1. Elaboration of a graphical charter, meant for the programmers in this new environment. After this evaluation, Forms 4 and Oracle*CASE are selected for further developments. Member of the development team of Askplus, report writer written in C. Askplus was originally written for the HP3000 (MPE) and was dedicated to TURBO-IMAGE. It has progressivly accessed the relational databases. I was precisely in charge of the interface with relational databases (Oracle, AllBase, Informix and InterBase), and of the implementation on customer sites of the new methods to integrate the reports. Askplus interface with the relational databases has been made with a Pro*C (or equivalent) driver. In Oracle's case, it was also possible to do the same with OCIs, without driver. Askplus has been implemented on three systems : MPEXL, UNIX (7 platforms) and VAX-VMS. It was also working on DOS with its OCI version. Member of the development team of ABSOLU-RH, human resource management and payroll system written for HP3000, MPE and TURBO-IMAGE. It has been completely re-written for its release 7, using C and Fortran 77. It was originally written in Fortran 66, Fortran 77, Pascal, SPL and COBOL. Data Processing class at the "École Nantaise d'Informatique", dedicated to COBOL with HP3000 and TURBO-IMAGE. Eight months sailing double-handed around the Pacific on a 42' ketch. Here is the chart. San Francisco CA, Nuku-Hiva (Marquesas Islands), Ua Pou (Marquesas Islands), Rangiroa (Tuamotu), Tahiti (Society Islands), Moorea (Society Islands), Huahine (Society Islands), Taha'a (Society Islands), Raiatea (Society Islands), Bora-Bora (Society Islands), Tongareva (Cook Islands), Kiritimati (Kiribati Republic), O'Ahu (Hawai'i Islands), San Francisco CA. Racing on board Kookaburra, J105 in the San Francisco Bay. 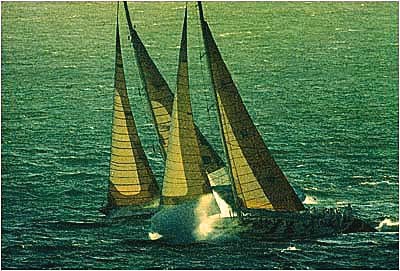 "Trophée des Multicoques" on Paul Ricard, 60' foiler (Skipper Éric Tabarly). 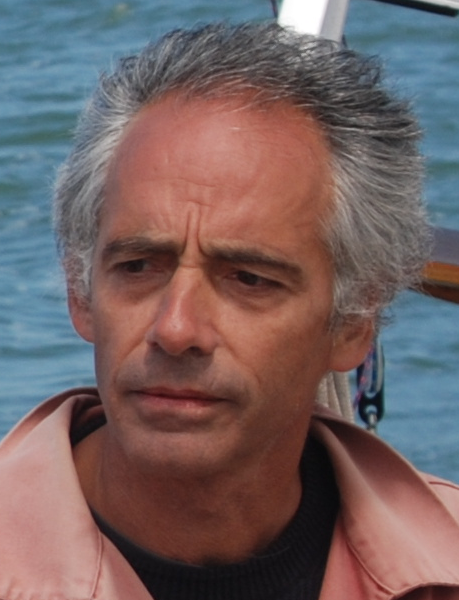 "Trophée des Multicoques" on Paul Ricard (Skipper Éric Tabarly). Observer Singlehanded Transatlantic Race (OSTAR) on board "Numéro Cinq"
During this race, we were the first boat to ever break the 500 nautical miles a day barrier, doing 508 nm in 24 hours. Formule Tag (skipper Mike Birch) broke our record 2 days later - doing 512 nm in 24 hours. We enjoyed the record for two memorable days. Ruta del Discubrimento (Malaga - Santo-Domingo) on Paul Ricard. 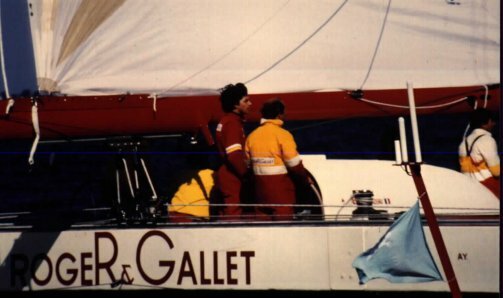 "Trophée des Multicoques" on Roger & Gallet, 80' catamaran (Skipper Éric Loizeau). Winner All Classes ! 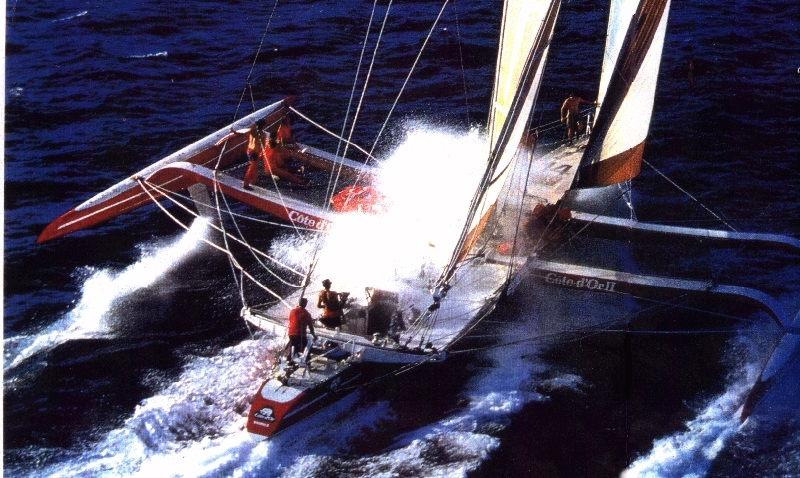 "Trophée des Multicoques" on Royale, 85' catamaran (Skipper Loïc Caradec). Winner All Classes ! Navigator and Skipper on Milène V, IOR Maxi, 70'. 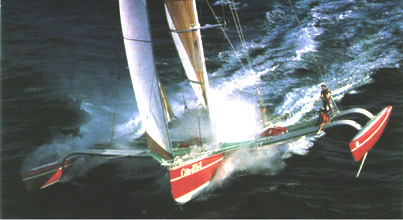 "Trophée des Multicoques" on Côte d'Or 2, 80' foiler (Skipper Éric Tabarly). Winner All Classes ! 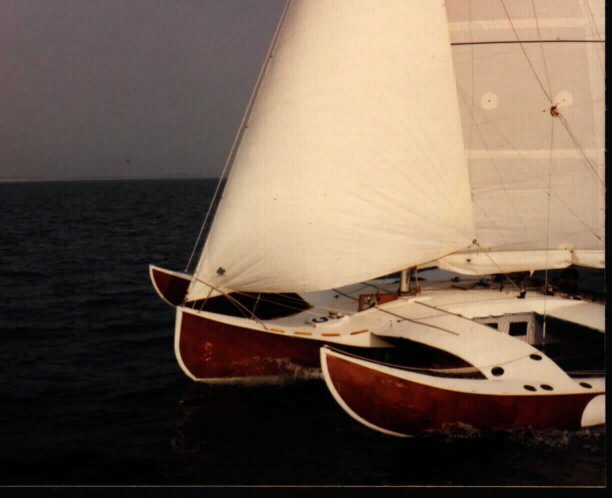 Designing and building "Numéro Cinq", a 30' trimaran for the OSTAR (Observer Singlehanded Transatlantic Race). In charge in the "Centre de Formation à la Croisière" of the charter fleet (30 sailing boats). Yachts Delivery from Brittany to the South of France, through the Gibraltar Strait. Profesionnal Sailing instructor in Cap d'Agde (Mediterranean Sea, France). Leading sailing classes in French, Italian and Spanish Mediterranean Sea. Sailing instructor in the "Groupe Finistérien de Croisière". Leading sailing classes in Jersey, Guernesey, Sark, the South of Cornwall (England), and the South of Ireland. Sailing instructor in Beg Meil (South Brittany, France). Open Source Contribution. Java, Scala, Groovy and other JVM-aware languages.